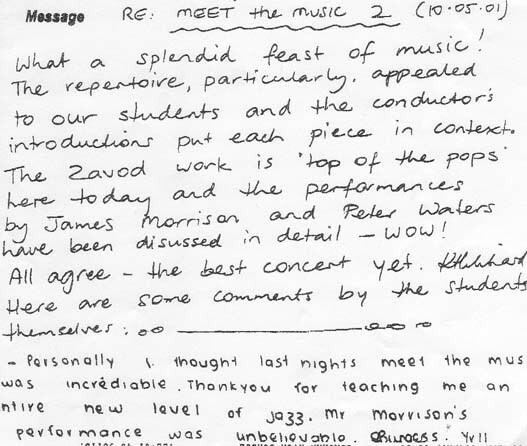 Allan Zavod's thank you letter from Keira Technology High School, and a congratulation letter from Melba Conservatorium of Music. 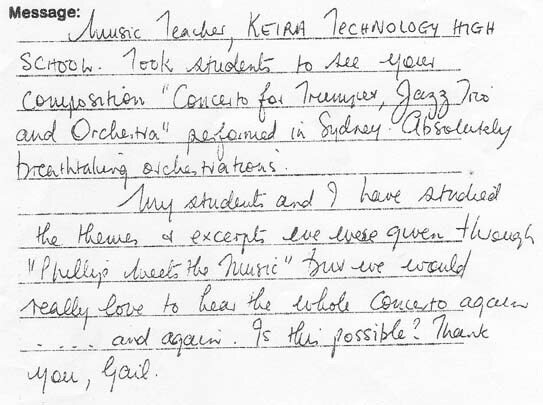 in 2001, Keira Technology High School took students to see the composition "Concerto for Trumpet, Jazz Trio & Orchestra", in Sydney for the "Philips Meet The Music" program. They wrote a letter to Zavod about the performance: "What a splendid feast of Music! The repertoire, particularly, appealed to our students, and the conductor's introductions put each piece in context. The Zavod work is 'top of the pops' here today and the performance by James Morrison has been discussed in detail - WOW!" "With the increasing popularity of jazz as an art form, the fusion of jazz and classical music offers a relatively new platform for composers. This concerto challenges James Morrison to employ both his disciplined classical virtuosity and rich jazz experience within one major work. As part of the teaching process, Allan has provided insight into the construct of the Concerto. Tutorials and Resource Kit are available at the link below. 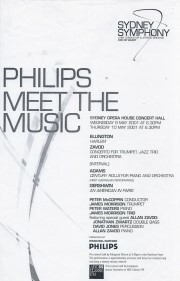 Reproduced with kind permission of the Sydney Symphony Education Program. Score excerpts and sound files are reproduced with permission of the composer and performers. 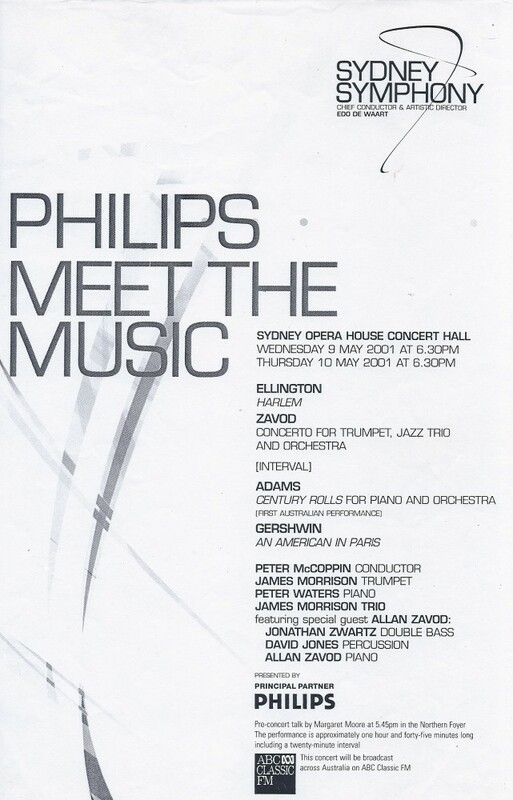 Concerto for Trumpet, Jazz Trio and Orchestra was commissioned in 1997 by Symphony Australia for the Adelaide Symphony Orchestra and soloist James Morrison. The work is in one continuous rhapsodic movement with an opening Adagio section. It represents Zavod's interest and expertise in both jazz and classical music in that it is a fusion of these two styles. Jazz characteristics such as modal and chordal improvisation, jazz rhythmic features (including syncopation, Latin rhythms, swing rhythm) and tone colour effects are explored within a formalised classical structure using a symphony orchestra with a jazz trio. Distinct tone colour changes highlight the various combinations Zavod explores in this piece, from full orchestra to jazz quartet (with solo trumpet) creating a 'club' atmosphere, to brass combinations suggesting the swing style.